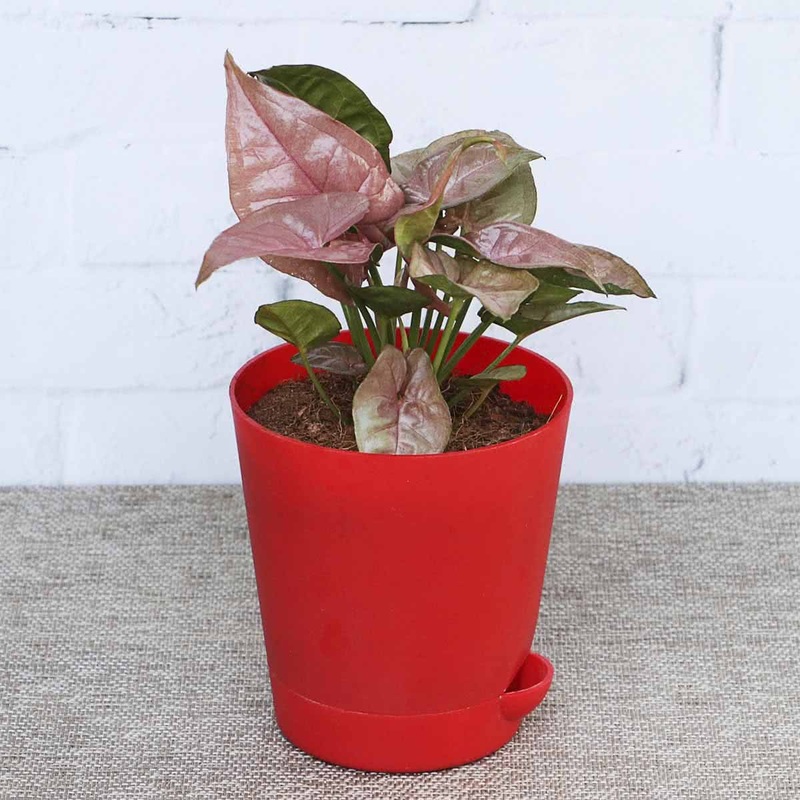 Plant Description: Syngonium Pink Neon is an indoor ornamental foliage creeper, suitable for small pots & trellises. 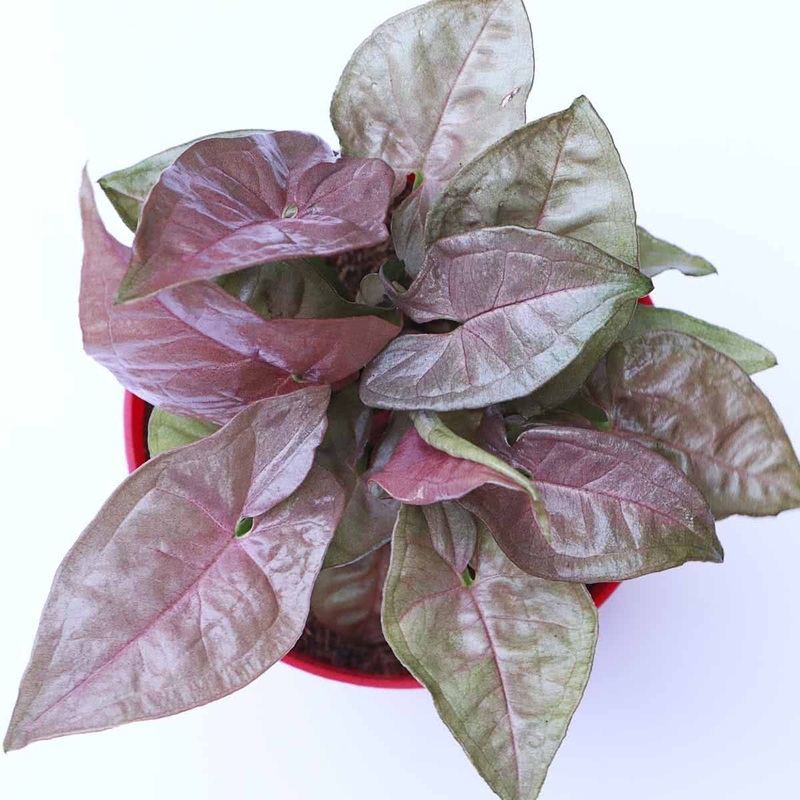 It is a beautiful miniature plant, featuring heart-shaped leaves with pink-green variegation. Syngonium Pink Neon is most suitable for green walls, hanging baskets, terrariums, bottle gardens, dish gardens & other tabletop miniature gardening use. Average Landscape Size: Planted in distance of 1.5 x 1.5 ft for ground cover. Soil: Syngonium Pink Neon is not very fussy and particular about soil. It can be grown in well drained sandy soil or coco peat. Pot Size: 8 to 12 inch round pot. 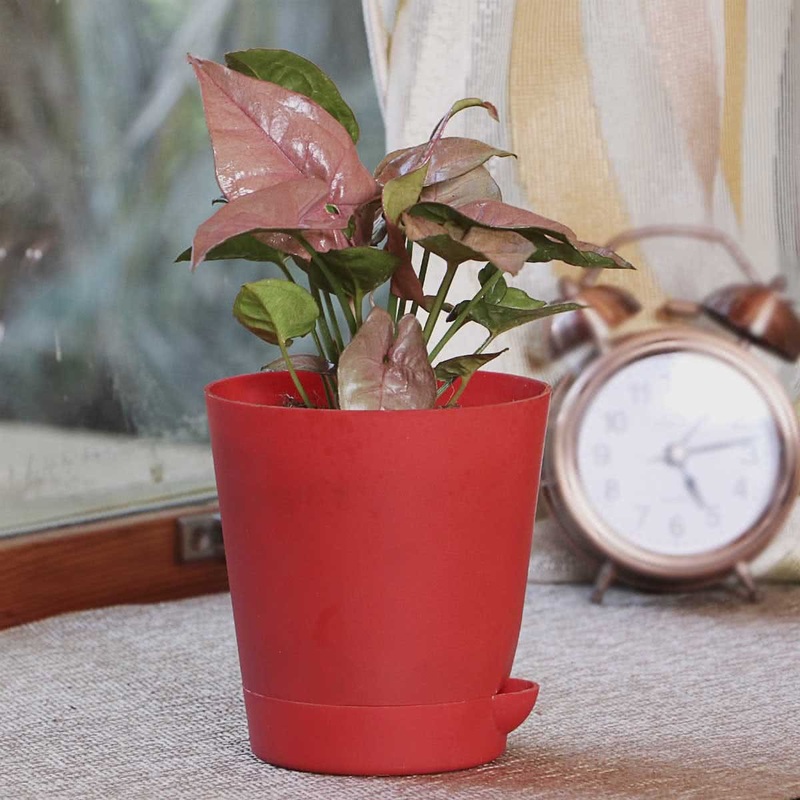 Potting/Transplanting: Transplant the Syngonium Pink Neon saplings in a pot along with root-ball of original soil. Carefully place the plant in the middle of the container & cover the roots completely with remaining soil. Sunlight: Syngonium Pink Neon can grow in full shade (indoors) or partial sunlight (outdoors). Direct sunlight will burn the foliage & stunt the growth of the plant. Water: Syngonium Pink Neon must be kept well watered throughout. Maintain the soil evenly moist, but allow it to dry out between waterings..
Fertiliser: Add rich compost/ leaf mould & well rotten cow dung while potting a plant. Temperature: Syngonium Pink Neon prefers pleasant warm temperatures. Minimum temperature requirements are 15 Degrees Celsius. Humidity: Syngonium plant likes hot & humid climate. Pruning: Train the climber to grow in desired direction & shape by cutting off the unwanted growths. Propagation: Vegetative Propagation is easy from cuttings. The plants root from nodes wherever these touch the ground. Plantlets can be easily split from the base. Ugaoo User Review Review by Rui.. I am very happy with ALL the syngoniums I have picked up from ugaoo so far. They are growing beautifully & lush. The syngoniums delivered have been very healthy plants.